This month’s theme really gave me pause. What exactly is a Canadian recipe? What came immediately to mind under the heading of ‘Canadian’, after Saskatoon berry jam, was Ambrosia salad. Hmm, the former’s good; the latter, well, is not what I’d call a favourite. Is it something the pioneers would have made? But then, which pioneers – the English, the Ukrainians, the French and so many others? Don’t forget all the Native Canadians with their own special recipes. All of that does fit into the concept of Canadian-ness, but I realized, luckily before I developed a migraine, that none of that really matters. This is supposed to be my own cherished Canadian recipe, and I have to decide what it is based on what dish exemplifies Canada to me. There, that’s not so hard now, is it? Pumpkin pie, to me, is quintessentially Canadian. My family never had it when I was growing up because it wasn’t part of our own cultural/folk food. My Anglo friends would have it. Truth be told, I wasn’t the least bit interested in trying it. I mean, really, sweet pumpkin? No, thanks. Being the child of immigrants, I had an experience, like so many of us, of growing up not-quite-inside and not-quite-outside the majority culture. I was always wanting my mother to buy Kraft Mac & Cheese, Chef Boyardee, Cheez Whiz … any of these products I saw my friends consuming. Eating those products on occasion made me feel like I was the same as everyone else. Thankfully, my taste buds eventually matured, and the appeal of those products faded. So, did my need to define myself according to my friends’ cultural practices. But, pumpkin pie still intrigued me. Tasting it was no longer about needing to relate. It was curiosity. What does sweet pumpkin taste like, anyway? So, one day at Swiss Chalet – another quintessentially Canadian icon – I decided to order a slice. You pumpkin pie aficionados are probably thinking that maybe I should have started with a better sample. No, Swiss Chalet’s pumpkin pie isn’t the finest example of that harvest treat. But, it was a good starting point for me. I learned that sweet, spicy pumpkin is indeed delicious. From that point, I began experimenting, tweaking recipes I came across on the cans of pumpkin purée until I created my own favourite variation. 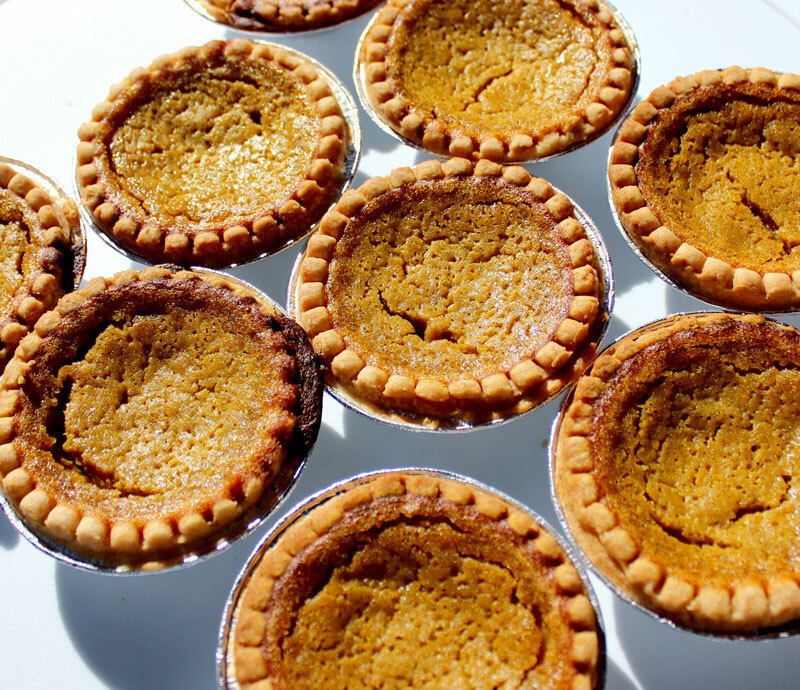 My pumpkin pie recipe has bridged that cultural gap for me, especially when I make it with Italian shortcrust pastry. It’s also become my (extended) family’s favourite, too! You’ll notice in the recipe below, that the essential spices – cinnamon, nutmeg, ginger and cloves – are all still there. But, I’ve made one or two other changes to it. I use coconut milk instead of cream. Dairy doesn’t love me as much as I love it, so coconut milk is a nice way to solve that issue. For Thanksgiving, I always pour the filling into either homemade shortcrust pastry or into pie dough (depending on how much time I have!). But the rest of the year, I pour the filling into pre-made pastry shells. They make a great lunch snack! What’s your favourite version? Add spices into pumpkin purée; stir well. Add remaining ingredients, stirring well after each addition. Pour into pre-baked pie shell. Bake at 350°F for 30 to 45 minutes, or until centre is just slightly jiggly. Love the idea of coconut milk for those that are lactate intolerant – or not. It just sounds delicious. I actually love the filling so much, I look forward to making extra baked without a crust, just as a pudding. So good for you and yummy! Thrilled you are participating in The Canadian Food Experience Project, Rosemary. Really enjoy reading your articles on the topic.